Successfully Added Xiaomi Mi Drone - 1080p Camera, FPV Support, 18m/s Flight Speed, 500m Distance, 120m Height, 27 Minutes Flight Time to your Shopping Cart. Take off and conquer the skies with the Xiaomi Mi 1080P video drone. This extraordinary drone comes packed with the latest hardware, allowing you to enjoy the most up-to-date features the drone industry has to offer. Equipped with a 1080p camera this Xiaomi drone additionally allows you to shoot stunning footage and images whenever you hit the skies – letting you observe your surroundings from a totally different perspective. Featuring a high-end 1/2.3 –Inch CMOS sensor, this FHD camera is capable of shooting sharp and detailed footage at 60fps – allowing you to take stunning recordings from above. Additionally, this Quad-Copter also supports 360-degree photography, literally enabling you to take your photography skills to entirely new heights. Packing an epic 5100mAh battery, this RC drone from Xiaomi allows you to speed through the skies and shoot mesmerizing images and video for a stunning 27 minutes continuously – truly setting it apart from its competitors. Featuring an ultra long-distance flight distance and height, this Quad-Copter allows you to reach mesmerizing distances of 500 meters and stunning heights up to 120 meters. With a take-off speed of 6m/s and a regular flying speed up to 18m/s you can be assured that, with this extremely fast video drone at hand, you’ll be able to reach any point of interest in your surroundings in absolutely no time. Featuring a durable design and being easy to operate and maneuver, the Xiaomi Mi Drone is the perfect Quad-Copter for beginning drone pilots and advanced drone enthusiasts alike. With its high maneuverability, this video drone can be perfectly flown in tight spaces – allowing you to fly both inside as well as outside in the open air. Its one-key automatic take-off, return, and landing features further increase your user experience with this magnificent drone, making it extremely easy to operate. For those that like to push this video drone to its limits, there is no need to worry about losing track of this beautiful device. Thanks to its colorful LED lights that have been located at the bottom of this RC Drone it will always be easy to spot in the air, even when flying in bad weather conditions or after dark. Additionally, this video drone features a low voltage warning that informs you when your drone is running low on juice – ensuring that your Quad-Copter will never run out of power whilst in mid-air. 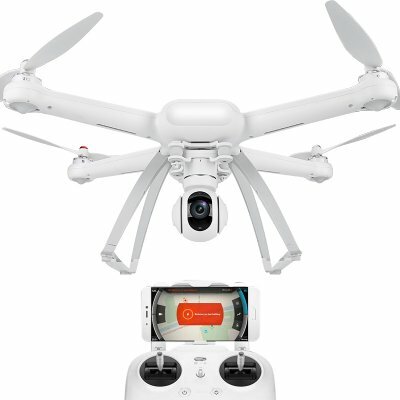 Supporting FPV technology, this Xiaomi Mi Drone can be easily paired through a wireless connection with your smartphone or FPV glasses, allowing you to enjoy a first person view of your drone experience that will make you feel as if you were flying through the skies yourself. Receive instant footage and pictures on your smartphone or enjoy a live first person view through your FPV glasses, with this video Quad-Copter your possibilities will be limitless. With all its features and video capabilities, this RC drone from Xiaomi will bring along hours worth of joy and entertainment that is guaranteed to spice up the lives of advanced and beginning drone pilots alike. The Xiaomi Mi Drone comes with a 12 months warranty, brought to you by the leader in electronic devices as well as wholesale electronic gadgets..